This Year's World Cup Songs, Ranked We judge a handful of exuberant stadium anthems written for the 2018 tournament. Will any of them prove as enduring as Shakira's "Waka Waka (This Time for Africa)"? Or will they sink into oblivion? 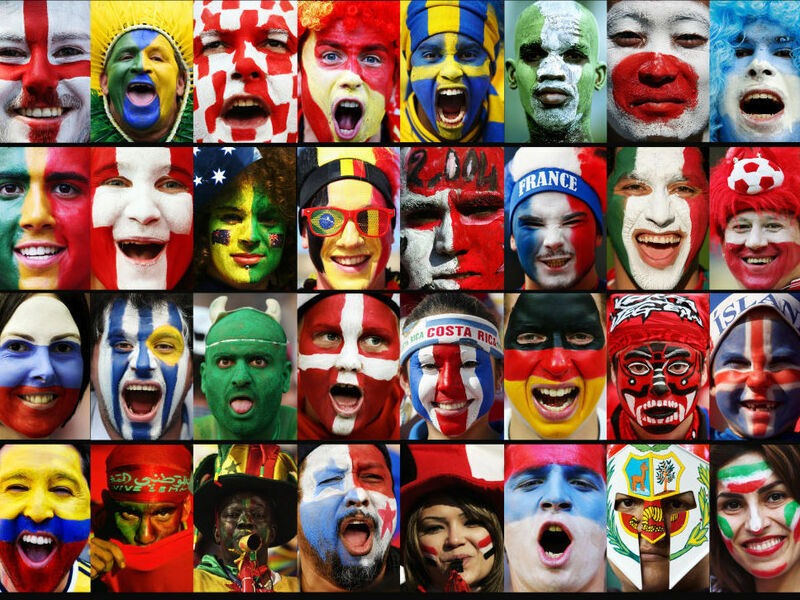 A composite image of fans of each of the 32 national teams participating in the 2018 FIFA World Cup in Russia. It's almost World Cup time — and there's a long, sometimes proud and often embarrassing history of international pop stars creating confections for the games. For every bit of surprising transcendence, like Youssou N'Dour and Axelle Red's collaboration for the 1998 tournament in France, there's New Order's unbelievably corny "World in Motion," written for the 1990 Cup in Italy. (New Order! Doing a soccer anthem! Featuring a thoroughly awkward rap break from footballer John Barnes!) And sometimes, a World Cup song soars so high that it breaks the bonds of its birth: witness Shakira's smash "Waka Waka (This Time for Africa)," which became an inescapable global hit. So with the tournament beginning on Thursday in Russia, we're ranking a handful of this year's foremost songs on their own aesthetic terms, irrespective of politics, nationalistic impulses, or previous fandom of the artists. Hey, the World Cup is the big leagues — every entrant deserves a chance at glory. Reggaeton star Nicky Jam's "Live It Up," featuring Will Smith and Era Istrefi and produced by Diplo, is this year's official FIFA World Cup jam. Sung in English and Spanish, it's got a lot going for it. The six-note chorus ("Ohhhhhhhhhhh") is easy enough for little kids to sing along with, and who doesn't love some retro, ska-style horns and backbeat? Is Will Smith, Nicky Jam, Diplo And Era Istrefi's World Cup Anthem Good? Who Cares? "Live It Up" also goes for a bit of grandeur. The video links the world's most popular sporting event with Roman-style, gladiatorial glory of yore by featuring a quote from 1st-century B.C. Latin writer Publilius Syrus: "Where there is unity there is always victory." A yellow card, though, for Albanian singer Era Istrefi's vaguely Caribbean accent when she sings in English — a bit of appropriation that has earned her criticism in the past, too. ("Jamaican music can be so powerful," she told Noisey in 2016. "It just makes me feel good and brings out my positivity.") We'll give this one four cups out of five. On Saturday, Uruguyan telenovela star-turned-pop-chanteuse Natalia Oreiro dropped a tri-lingual song, "United by Love" — sung, cannily, in Spanish, English and Russian. It's got a catchy, simple, stadium-ready chorus with rah-rah lyrics: "Put your hands up and show your spirit! Everyone around the world can feel it!" Extra points for another savvy nod to the 2018 host country, as expressed in Oreiro's costuming for the video. She's sporting a candy-colored kokoshnik, a traditional Russian headdress. Three cups. Russian singer, model, actress and former Eurovision competitor Polina Gagarina, rapper, pop singer and The Bachelor Russia star Egor Kreed (born Egor Bulatin) and EDM producer DJ Smash (Andrey Shirman) have teamed up for a soccer song called "Komanda 2018" [Team 2018]. Unsuprisingly, the Russian lyrics are pretty anodyne — "We believe and dream ... you're our team!" etc. — and so is the song's structure, with an EDM drop that sounds perfectly 2015. In 2018. Although the lyrics to "Komanda 2018" aren't political per se, it's worth noting that both Gagarina and Smash are vocal supporters of Vladimir Putin. Thematically, this song would fit just as well at a campaign rally as at a sports stadium. And sometimes, lyrical simplicity is a virtue with ancillary rewards; as one blogger observed of Egor Kreed's oeuvre overall, "His lyrics are so simple and mundane that they are a perfect aid to help first-year Russian students learn the language." Two and a half cups. However awkwardly, Derulo also tries to reach for some bigger ideas in this upbeat paean to multiculturalism that's also, inescapably, a Coke ad. "We still got a long way," he sings tenderly, "but look how far we've come now." Three cups. The television network Telemundo also commissioned its own official song for this year's Cup, tapping Colombian megastar J. Balvin and Haitian DJ and producer Michael Brun's for the song "Positivo" [Positive]. Like almost every other song in the World Cup genre (and at this point, it's at least a sub-subgenre of its own), the lyrics of "Positivo" call for a global party: "Todo el mundo bailando ya" ("Everyone's dancing by now"), and so forth. With a chorus of "Fire, fire," this structurally bare-bones song aspires to be a banger — but alas, the result is rather sodden and flat, as if Balvin and Brun just dialed it in. Two cups.